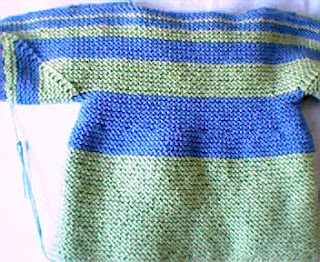 It turned out a little bigger than I anticipated, but I have plenty more of this yarn left, so I may do a smaller sweater so my niece/nephew has something to wear right away and doesn't have to wait 4 months to grow into the Baby Surprise. In the meantime, I'm working on the log cabin-style blanket. I'll post a picture when I get a few more sections done. 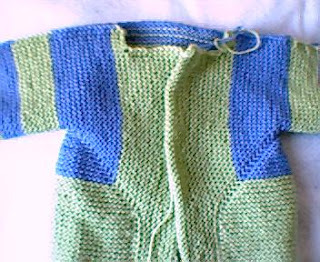 What a very beautiful baby sweater this is! 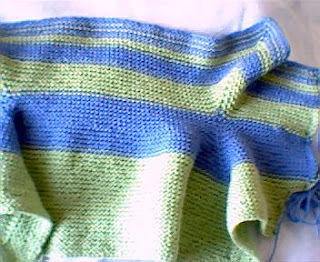 I really love the pattern as well as the colors you chose - and I'm sure the little recipient is going to adore it! Great work! Thanks, Dipsy! I'm glad you dropped by. Wow, that sweater looks great! And it photographed so well! Nicely done, all around!